Cleansing your hair is an extremely important part of any hair care regimen. Within the context of the Coily Queens Regimen it falls under the category of moisture. When you cleanse the hair correctly it does not strip the hair but hydrates the hair. Daily your hair accumulates: sweat, excess sebum, product buildup, dirt and more, for these reasons you should have a frequent cleansing routine. Cleansing helps to hydrate and refresh the hair. Hair grows best on a clean scalp. More information on the importance of shampooing your hair often here. Use an actual product meant for cleansing the hair. Conditioner is not formulated to cleanse the hair. Look for labels with the least long words that you cannot pronounce. Choose a cleanser that is PH balanced between 5 and 8. Do not exceed a PH of 8. The only way to know the PH of your cleanser is to test it yourself using PH balance strips. 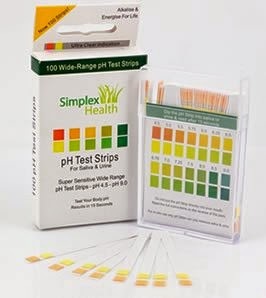 These are the PH strips I use. PH balance strips are very helpful on your hair care journey. Small investment with a huge payoff. Start your shampoo on hair that has been untangled and is knot free. If you are transitioning or dealing with lots of tangling issues it would be wise to shampoo your hair in medium to large twists. Allow medium to hot water to run over your hair saturating your hair really well. Use your fingers to pull residue from your hair. Smooth from your scalp down your strands gently. Do this process for 2 minutes. Apply a quarter size amount of shampoo to your hair starting at the scalp then smooth gently down the hair strands. Depending upon your cleanser how much you use will vary. After you have massaged the shampoo through your hair, rinse with medium or hot water. The first wash is to remove any residue from the hair. Lather on more shampoo or your cleanser and repeat. Always rinse off your cleanser using medium or hot water. Higher temperature water makes your hair cuticle open wider to receive the moisturizing benefits of your conditioner. You will notice after your second lather that your curls begin to pop. Your curls feel more alive and defined. Pay close attention to how your hair feels with this two lather process when you try it. I'm glad to see you say "Conditioner is not formulate to cleanse the hair." So many ladies use regular conditioner to cleanse and while it makes the hair soft, I don't believe it's getting clean either. I wrote an article on my site that was reposted and got a lot of backlash on CurlyNikki.com I basically said I like long hair and that it's a reflection of God's full crown and glory upon a woman. It was not meant to demean someone without long hair. I wasn't even referring to my own hair but the hair of others. I really appreciate a woman with beautiful long hair. I, like you believe that no matter the ethnicity of the person, has the ability to grow long hair. And if a person doesn't want long hair, that's certainly a choice but there's nothing wrong with those of us who do and I sincerely don't believe that God has a problem with us wanting it either. I was wondering if I still needed to go through the two stage process, I do thoroughly wet my hair though so I have noticed the curls popping. As I sit here now (doing my pre-poo), I know now to adjust my shampoo regimen. One question, I am clarifying today and I have Giovanni Clarifying Shampoo. Is that a good clarifying shampoo? I was just curious.